I hope you're all as excited to read this post as I am to write it, because...I finally went to Chez Pascal! Shortly after moving to Providence, and seeing this unassuming little restaurant nestled off Hope Street, people started telling me how great it was. But, time and money are always of the essence (especially when you are a food writer- why couldn't I pick something cheaper to blog about!?) and there are so many restaurants to try, and so I couldn't find the opportunity. I did make it to the hot dog cart over the summer, and that trip just served to peak my interest. But, finally, last night Andy and I went for it. I called, made the reservation, and checked the clock all day long until it was time to go. The place inside is adorable- comfortable and warm, but classy. All of the staff are friendly and relaxed. There are no pretensions anywhere at this restaurant. They actually split the salad for us in the kitchen, and Andy doesn't like blue cheese, so I got this beautiful round of blue cheese flan all to myself. I am always surprised when a salad overwhelms me with its deliciousness. I usually like to try other appetizers, and only turn to a salad when I'm afraid of being too full, or nothing particularly strikes me. 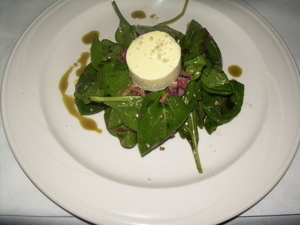 I chose this salad for the latter reason (I did want the escargots, but Andy would not go for that), and also because the flan and the pumpkin seed oil interested me. And I am very glad I did. For such a simple salad, it packed a lot of wonderfully subtle tastes that worked perfectly together- the light dressing, the creamy (but not too strong or pungent) flan, the sweet apples, and the crunchy walnuts. Again, the simplicity of this dish, yet the wonder of the flavors, delighted me. 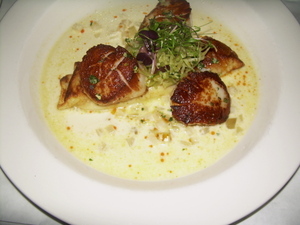 The beautiful, rich flavor of the celery root thrived in the butter sauce, and the crepe added a nice texture and cheesy flavor dimension to the scallops. The scallops were absolute perfection with their crispy seared outsides, and warm buttery insides. I honestly wish I had more details to provide about this dish, but Andy can't remember, and Chez Pascal is closed on both Sunday's and Monday's. But, on Tuesday, I plan on calling to gather the details and I will re-post them here! Details aside, this was fantastic. 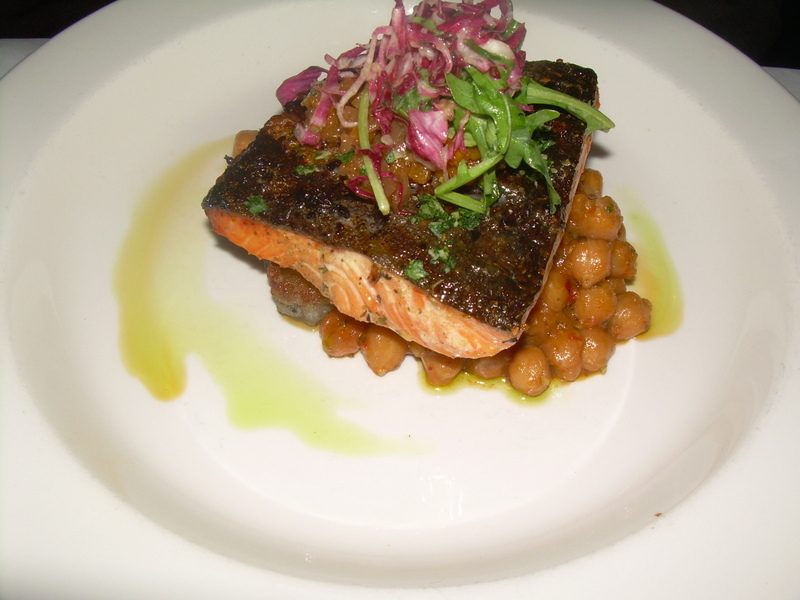 The sweetness of the chickpea salad contrasted with the saltiness of the glaze and the fish brought to mind a Moroccan flavor, and it was very well executed. And then, dessert. There were two items on the menu that we really wanted to try, and we couldn't bare to get just one. We asked the waiter if it would be an obscene amount of dessert, and he said no- so we trusted him. In reality, it was a lot of dessert. But, admittedly, we ate it all! Oh my. There are not words enough to describe this wonderful ending to our meal. Everything was delicious. The chocolate and peanut butter mousse, I think, was the winner of the Chocolate in 3's- but I am hopeless in the face of anything with peanut butter and chocolate. I am also an avid fan of chocolate desserts, and rarely order fruit type desserts- but this bread pudding will make me think twice before skipping right to the chocolate desserts. It was moist and perfectly sweet. 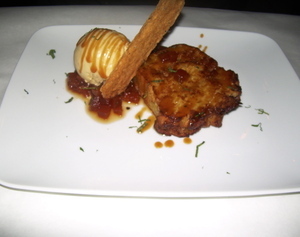 It wasn't too dense (as some bread puddings can be) and a bite of the pudding, drenched in apple compote and with a spoonful of maple ice cream was perfect harmony. 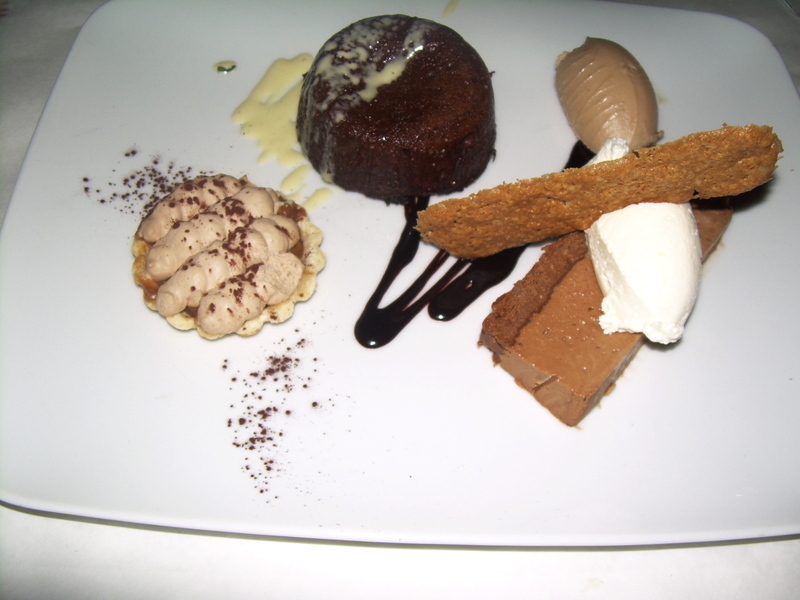 Throughout the whole meal, I kept asking myself why I waited so long to go to Chez Pascal. Dear readers, you were right in your insistence that I must go. It was one of the best meals I have had in recent memory- it truly trumped some of my more recent fine dining experiences in Providence. As we left, I met one of the owners, Kristin- and I could not stop smiling as I told her how wonderful the meal was. And her reaction made me love Chez Pascal even more- she acted like a brand new restaurant owner, who had heard her first compliment. She was genuinely overjoyed that I enjoyed my meal, and seemed flattered that I would take the time to tell her. I will, absolutely, be returning. Weird, this post didn't come up when I went to your homepage, only after I clicked around a bit. Did anyone else have this problem? It is just like yours, minus the snacks in rooms. We each go to our beds and read or look at books, they may play something quietly on their bed or they may rest. After one hour, it seems we are refreshed and restored and happy to see each other!